These unique teardrop shaped keychains in are perfect for pet lovers everywhere. Each keychain comes with the charm of your choosing. Choose the charm that best descibes your pet. Available in deep red, royal blue, pink, black, tan and chocolate. 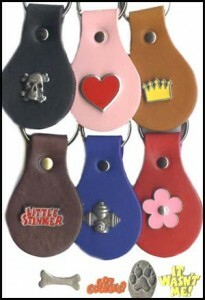 Teardrop size (leather only) – 2.75 inches (7cm) long. Comes with a 1.25 inch keyring. Leather and charm colours may vary slightly.